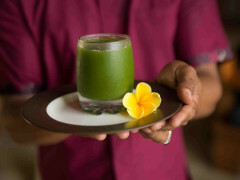 Why The Signature Detox Retreat, Bali? Even we at Life of Riley need time out to love, respect and take care of our body, mind & spirit. And where do we go to detox from the stress and give our monkey-minds chance to recover? We take a well-earned, healing journey of detoxification and transformation in Bali. And where do we go to detox from the stress and give our monkey-minds chance to recover? We take a well-earned, healing journey of detoxification and transformation in Bali. Nestled on the banks of the Ayung River, near the town of Ubud, this 14-day detox program has been inspired by the ancient Balinese philosophy that promotes living with purity of thought by encouraging us to align our heartfelt goodwill and thinking with consistent speech and action. What Makes This Retreat The Most Luxurious Of Them All? Staying in scandalously luxurious bamboo huts, you’ll’ experience how traditional Balinese healing therapies detoxify and purify the physical body (sekala) and the non-physical mind and soul (niskala) by unifying bodyand mind towards a natural harmonious state of being, thus allowing an organic healing process to unfold. Our favourite highlights include: Balinese Healing Rituals, which will purify restore balance and encourage regeneration. Living Foods for detoxification, nutrition and vitality and Sacred Arts for inner strength, integrity & dedication. This is so much more than a detox retreat - it’s the change you’ve been looking for.